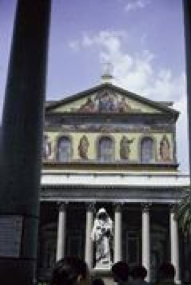 Consecrated with St. Peter's in 324 A.D., St Paul's was also aided in its construction by funding from Constantine. The first church was originally small and subsequently enlarged in 386 because of the sanctity of the site - it was very close to the burial site of St. Paul. The new design was created by Ciriades, known as "professor mechanicus," and seemed to follow the design of St. Peter's. A five aisled church, containing eighty columns followed a huge porch. It was consecrated in 390. We now begin an unbelievable but true litany of events, which befell this basilica. 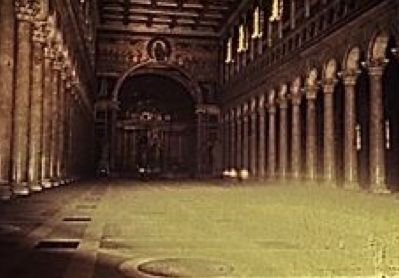 Either a fire or earthquake struck, and Pope Leo I restored the church in the middle of the 5th century. In 739, having withstood earlier attacks by barbarians pounding away at Rome, the Lombards came and sacked the church. Pope Hadrian I secured whatever treasures were left of the church, placing them inside the walls of Rome in 773. The Saracens attacked in 847. 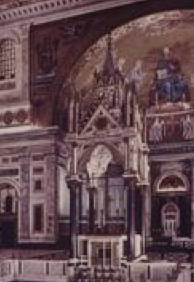 Afterwards, Pope Leo IV outfitted it with a new tabernacle with four silver columns. In the late 9th century, after more fighting, John VIII enclosed the complex within its own walls and towers to form a citadel. The site was then called "Giovannipolis," the city of John. This stood up to attacks from Henry IV in 1083 and 1084. Restoration followed some damage. In 1070 bronze doors were made in Constantinople and presented to the church. New mosaics were added in the 13th century. 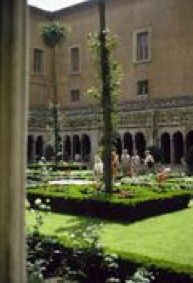 The cloister was begun on the south side of the church in 1205, finished in 1240. Frescoes were painted on the walls of the nave by a Roman named Cavallini, while the rather famous Florentine architect and sculptor Arnolfo di Cambio was making a tabernacle, at the end of the 13th century. Art was flourishing in Rome at this time. Cavallini created a mosaic on the façade - rather rare - and remnants can be seen inside the church. Tragedy again in 1348 when an earthquake struck, toppling the campanile, which had been erected in the 11th century. The tower was rebuilt, but the citadel was abandoned. For whatever remained, further damage ensued during the sack of Rome in 1527. Some restoration occurred n the late 16th century, but the new work obliterated some of the original creations. Chapels and new altarpieces were created in the 17th and 18th centuries, and the apse was restored. In 1823 a worker repairing the roof set off a fire that left very little of the basilica standing. Only a part of the façade, the triumphal arch, the transept, and the cloister survived the flames. Cavallini's frescoes were destroyed. The church had kept its original character despite repeated catastrophes for over 1,400 years. Then it was virtually gone. 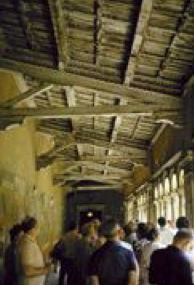 Communities throughout the world contributed to the new restoration. The Khedive of Egypt sent pillars of alabaster, the Emperor of Russia provided precious malachite and lapis lazuli for the tabernacle, the Italian government provided the restoration of the façade, and then declared the church a national monument. The transept was dedicated by Pope Gregory XVI in 1840, and the entire basilica was consecrated by Pius IX in 1854. Alabaster windows were an early form of fenestration, and it has to be assumed that these examples in the clerestory section of the nave are faithful recreations of the originals. 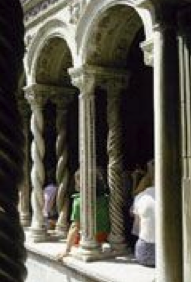 Early Christian architecture was one phase of late Roman architecture. We're about to see some variations in the north.